The stress and expense of moving day can be overwhelming. 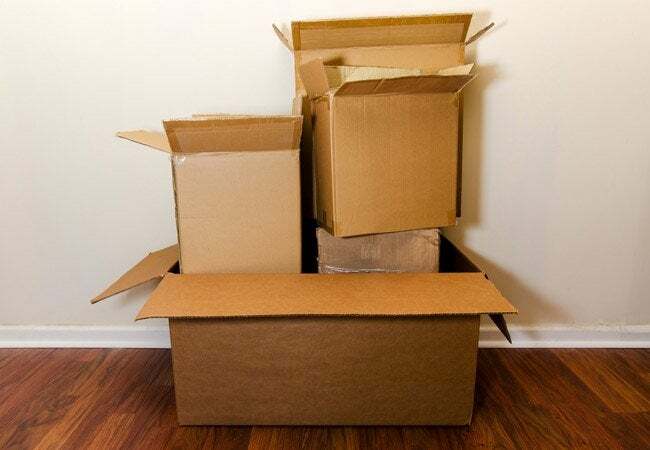 Save a pretty penny on cardboard boxes by checking out these local hot spots and websites that might give away these moving musts for little to no cash. Once the excitement of closing on a new house or locking down a great apartment wears off, reality sets in: Time to pack. Few tasks feel more overwhelming than boxing up your belongings in an organized fashion only to unpack them a few days later, desperately hoping that you can easily locate everything you need. That’s where cardboard boxes come in. There isn’t anything quite as easy to fill, label, and transport as these classic moving staples. The downside is, they don’t come cheap–especially if you’re packing up an entire house. Rather than blowing your moving budget on boxes, try hitting up a few places around town for free boxes instead. Start at your local grocery store. Most stores break down and recycle their boxes after they unload them, so give the manager a call to see if you can swing by and pick up the extras. Give them as much notice as possible: The manager may be able to time your request around the delivery schedule, which means more box inventory to choose from. If the grocery store doesn’t pan out, contact local liquor stores or bookstores. Both receive their products in large, durable boxes that are perfect for packing. Your local Starbucks has also been known to have extras from their shipments and may share their wealth with you if you ask the staff.